Due to the huge popularity of poinsettias, there is even a calendar day devoted to these beautiful blooms that we associate with Christmas — December 12 is Poinsettia Day! However, many people have unnecessary worry over having these plants in their homes because they think they are poisonous and deadly. So let’s take a closer look and try to dispel this myth! According to the POISINDEX, a child who weighs 50 lbs. 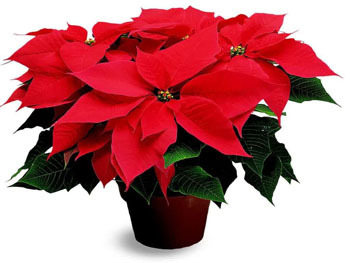 would need to ingest more than 500 poinsettia leaves to reach a possibly toxic dose of compounds in the plant. Furthermore, a review of over 20,000 reported cases of poinsettia exposure found that 92% of those exposed did not develop any symptoms at all, and 96% of those exposed were not even treated in a health care facility. However, even though accidental ingestion of poinsettia leaves will not damage your body or kill you, it may cause stomach upset, nausea, vomiting, mild to moderate gastrointestinal irritation, and skin irritation in sensitive individuals, so use your common sense and keep away from young children. The ASPCA similarly holds that poinsettias are not deadly. They state that the worst they have seen in pets who have eaten this plant is excessive drooling, vomiting and diarrhea, and that “its toxicity is over-rated”. Moreover, since the taste of poinsettias is very bitter, it is unlikely that a pet (or child, for that matter) will continue to eat it after the first taste. Again, it is best to keep poinsettias away from your pets in order to avoid gastrointestinal upset, but don’t let this myth affect you this Holiday season. Relax, and have a Happy Poinsettia Day! Disclaimer: This is intended for educational purposes and is not meant to replace medical or veterinary care. If your child ever ingests something that is poisonous, consult with a physician and contact your poison control centre. If your pet ingests something poisonous, consult a veterinarian and contact your local ASPCA or SPCA. Krenzelok EP, Jacobsen TD, Aronis JM, 1996. Poinsettia exposures have good outcomes…just as we thought. Am J Emerg Med, 14(7), 671-674.